Sometimes when idols leave their groups, it is the last time we, as fans, will ever get to interact with them. I can think of many idols who I was a fan of, who have moved on to the next stage in their lives. In some cases I knew they were graduating when I last saw them, in other cases I didn’t. It is those idols, the one’s I never gave my proper ‘best wishes’ to, that I feel the saddest about. Of course, just because an idol graduates from their group, it doesn’t necessarily mean that we’ll never get a chance to see them again. I remember when Meetan and Chaki graduated from SDN48, and I thought “Well, this is it.” But I DID get a chance to see Meetan again a few months later when she released her final gravure DVD. And of course Chaki has continued on as a solo performer, so I have had many opportunities to support her singing career. 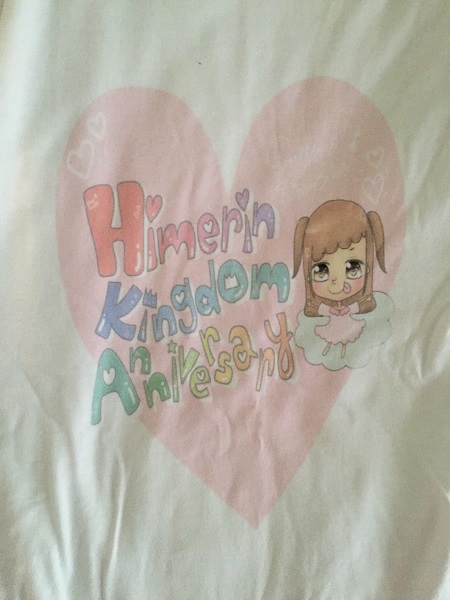 In the case of Yuki Himeri, she graduated from Alice Project while I was in America, so I never got a chance to say a final goodbye to her. 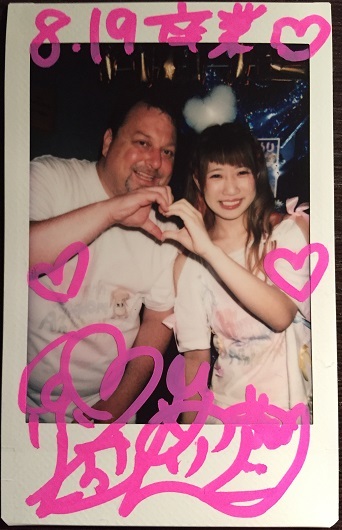 Luckily, my friend Anthony had kept up with Himeri, and knew that she had started a new Twitter account, and was doing various appearances around Tokyo as a freelance idol. I vowed to see her again, as she was one of the sweetest idols I had been fortunate enough to meet. And when I found out that she had joined a new idol group, ‘No Plan’, was very excited since I knew it was a matter of time before I ran into her at some idol event. And I did. Unfortunately, not long after that fateful reunion a couple of months ago, she announced her graduation from this new group. But she would be leaving in August, so that gave me plenty of time to see her before she leaves. I had the opportunity to see Himeri perform twice in her final week with ‘No Plan’. 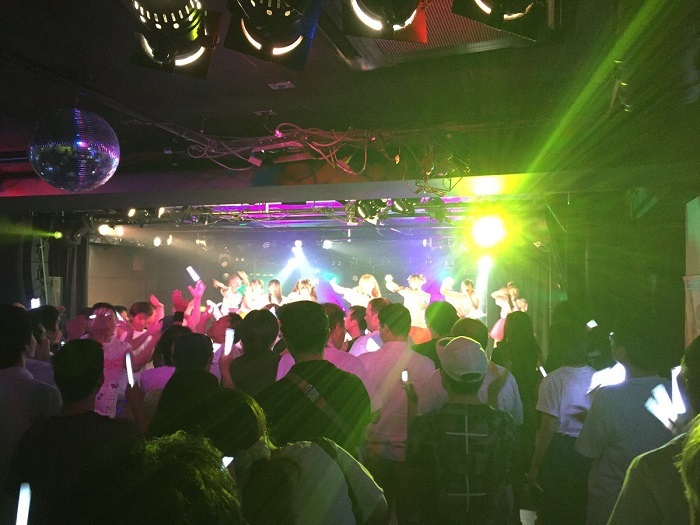 The first time was at a huge idol event called “Akihabara Idol Party Vol. 13.” which was an all-day affair featuring over two dozen groups on three stages in Akihabara. I was really only interested in seeing Himeri’s group, who were playing at Twin Box Garage at 5:45pm. Coincidentally, FESTIVE was also playing at Twin Box that evening, on the basement stage, but it wasn’t part of the Idol Party, so it required separate admission, despite the fact that it was in the same building. 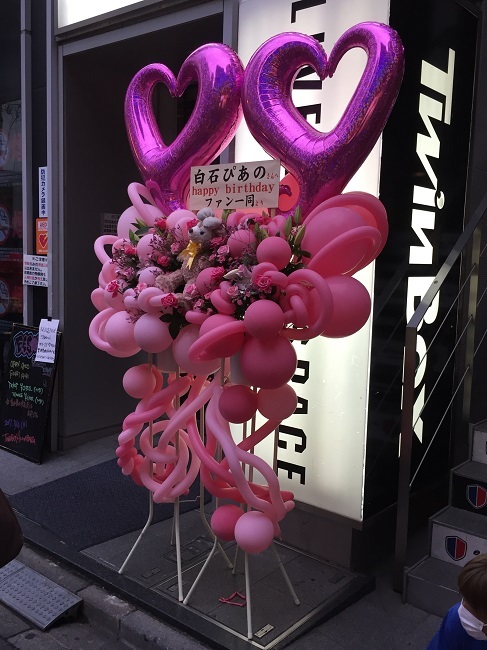 In fact, I got a good picture of the flower/balloon stand for Piano’s birthday. Fast forward to Saturday night. I was really excited to be going to see No Plan’s one-man live, which was taking place at Zirco Tokyo in the Kabukicho neighborhood of Shinjuku. I headed out a little early in an attempt to beat the incoming thunderstorm. My plan was to hand out at The Hub, which is right upstairs from the theater. However, when I got to Shinjuku it was pounding rain. Not only that, but the main cell of the storm seemed to be right overhead since huge thunder crashed and lightning bolts were raining down from overhead. I mean the thunder was so loud it sounded as if the lightning was striking the building. However, I knew a roundabout way to get closer to the venue underground, so I headed back into the subway and walked through the underground city in Shinjuku until I finally found myself at Kabukicho. From there it was only a half-block walk to Zirco, and The Hub. Unfortunately I don’t really know the names to any of No Plan’s songs. In fact, I am not sure how many of their songs may be covers from other groups. I DO know that they sang a few Alice Project songs, including Zenkai Hero, which is one of my favorites from the Alice Juban catalog. They also sang a few AKB48 songs, including GIVE ME FIVE and Heart Gata Virus. They performed for over two hours, and to my knowledge they don’t have any CDs, so it is no surprise that their setlist would have a few covers. Meanwhile, the fans were in full wota mode. Luckily, I was just on the edge of their circle, so I got to participate with them in the calls and other antics. At one point toward the end of the show, they pushed me up front and center, so I had to go full-wota mode so not to disappoint them. They had probably noticed that I was participating throughout the show. Overall, they put on a very nice show. I love most of their group songs, which are very high energy AND a lot of fun. They also did a lot of solos and units throughout the live, and some were better than others. Although I did think that Makino Momoka, aka Momo-san, the one with the pink hair, was a decent soloist. Probably the best of the group. To be honest, Himeri isn’t a very good singer at all, but she tries her best, bless her heart. The show finally came to an end after a heartfelt final song, as well as a very emotional speech by Himeri. She had the entire group in tears behind her while she spoke. 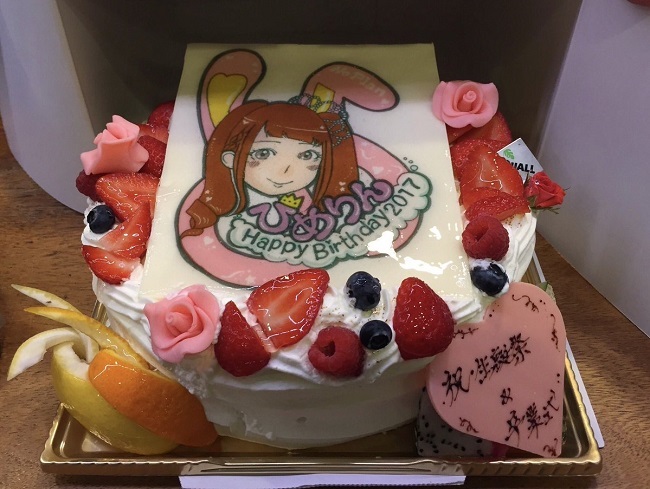 She also received gifts from the fans, as well as a cake. 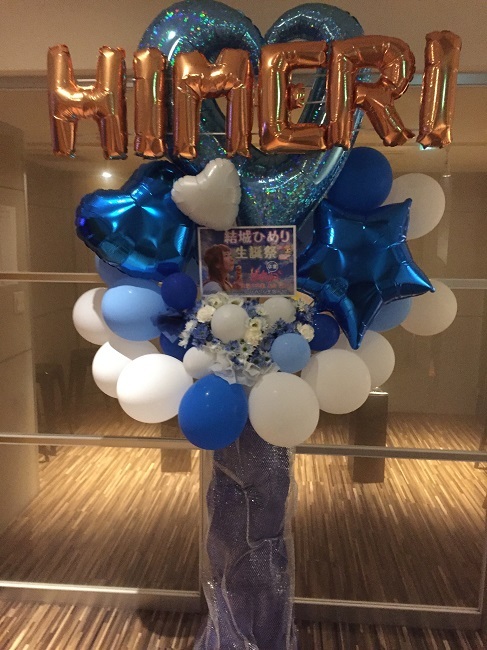 There was also a balloon/flower arrangement in the lobby, as well as a banner on the wall. All in all it was a very nice sendoff. It was a fun, powerful, and emotional show. I ended up buying two cheki tickets. I knew I would use one on Himeri, but I wasn’t sure about the other. As expected, Himeri’s line was extremely long, extending out of the venue and into the lobby. Luckily I lined up quickly so I was 5th to see her. I congratulated her on her graduation, and confirmed that she would be continuing to use the same Twitter account (she changed when she left Alice Juban) According to her fans, she recently signed with an agency, and has something new in the works, but for now it is a secret. 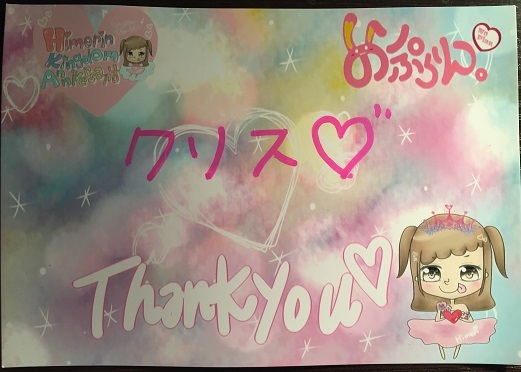 After signing the cheki, she also write my name on the special card we received when we entered the venue. Ultimately I told her that it was a great show, and I was so happy I came. After she confirmed that we would see each other again, I was on my merry way. So what to do with my other ticket? At this point I felt it would be anti-climactic if I lined up to see Himeri again, and there are a couple of other girls in the group I find interesting. 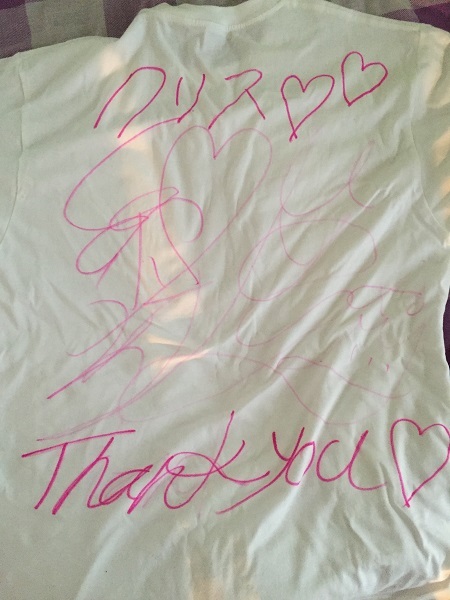 But after watching the total fanservice Momo-san was giving the fans who came to her, my decision was set. Her line was only three-deep too. The first thing she asked was if I was an American, Yep. From California? Yep. Disneyland? Yep, I used to work for Disney in Anaheim a long time ago. LOL. This girl is quite the psychic! She asked how I discovered No Plan, and I mentioned that I knew Himeri from her previous group. Anyway, I told her that I really liked her solo performance. And that I am living in Japan and learning Japanese. She told me my Japanese was already pretty good. (I had a few cocktails earlier, so yeah. The more I drink the better my Japanese apparently gets) Eventually our conversation turned to idols, and Wasamin. She was surprised I was into Enka, and when she found out I had seen Hikawa Kiyoshi perform live before, she started singing Kiyoshi no Zendoku Bushi with me, LOL. I think she was surprised I knew the song. It is a pretty well-known song though, even for people who aren’t necessarily into Enka. 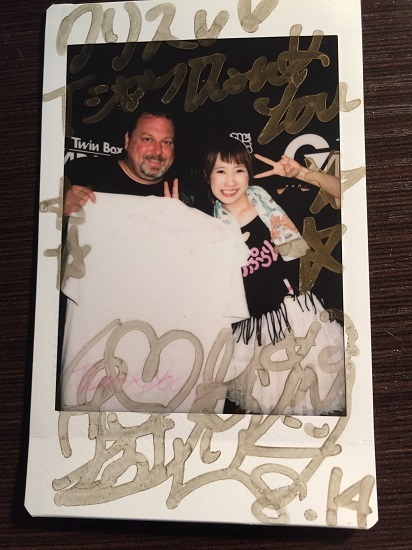 After signing the cheki she offered to take a Shamekai with me. So I went for it. And that was it. I had no more tickets, so I decided to leave the club. As a journeyed home I thought about whether or not I would continue to see No Plan since Himeri has graduated. They are fun, but usually for me to actively seek out a group’s shows, there has to be a member I really want to see. And I’m not sure there is anyone in No Plan that really fits that description anymore. But we’ll see. Hopefully they will be showing up at idol shows where other groups I currently like are playing. In that case, I will definitely check them out.